At Pampered Smiles, we offer the All-on-4® procedure for patients that are looking for a convenient way to replace missing teeth. If you live in the Atlanta area and have experienced tooth loss, we encourage you to visit our office to discuss the options available to you. There are distinct advantages to living in the modern world. One of these, from the dental perspective, is the ability to live without the stigma and challenges of tooth loss. According to the Periodontic Association of America, roughly 175 million people, of all ages, have lost one or more teeth and this number is actually expected to grow larger over time. What this has done is spurred growth in the replacement tooth industry and the revolution of dental implants. Implants are a way to get the most natural looking and behaving replacement teeth. However, the standard implant procedure is not always physically viable or convenient. In this situation, the All-on-4® procedure can be a better solution. All-on-4® is a minimally invasive method of placing a full mouth of implants only using four implants to support a full arch (upper or lower) fixed non-removable replacement teeth. All-on-4® allows you to have a full set of teeth without having to undergo multiple surgeries and replacements to place a full set of implants in your mouth. The greatest thing about All-on-4® is that the procedure we can typically complete it in our office during one appointment under local anesthesia. For our patients who have lost all their teeth or may need to have the remaining teeth pulled due to decay, this is an amazing advancement that allows them to have a full set of teeth without undergoing multiple procedures. Simultaneously, this solution gives patients the kind of teeth that look real and act like the original teeth. The simple answer is that anyone who has lost teeth and wants to have a permanent good-looking set of replacement teeth will benefit from dental implants. The All-on-4® systems offer people a chance to live a full and healthy lifestyle by replacing the teeth with implants over removable dentures. 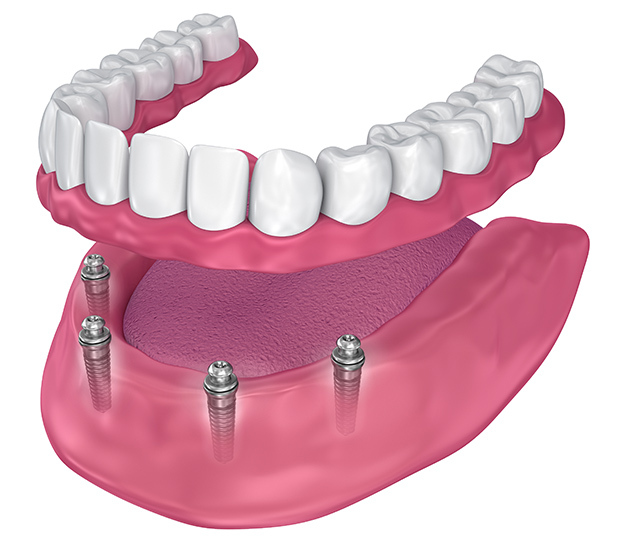 The ideal candidate for All-on-4® implants is someone who already wears dentures or is already missing multiple teeth. Additionally, this is an ideal procedure for someone that does not have the bone density to support a full set of individual implants, the time to have individual implants placed, or the budget to pay for them. The All-on-4® procedure is faster and more affordable. There are several ways in which All-on-4® implants are better than dentures. Patients take care of All-on-4® implants in the same way they care for their natural teeth by brushing each day. The implants also operate in the same way as natural teeth, so the patient does not have to be cautious of what he or she eats. Along with the fact that patients do not have to remove All-on-4® implants when eating or cleaning the teeth, there is also no need for uncomfortable wires or brackets to hold the implants in place. Even more importantly for patients, the dental implants allow anyone to eat what the heart desires. You do not have to worry about hot or cold affecting your dentures. You also can bite down with up to 70 percent more force, which allows you to eat the foods that you love. Finally, All-on-4® implants look exactly like your natural teeth. No one will be able to tell that you are wearing a dental prosthetic. From a dental health perspective, it is important to note that when you have All-on-4® implants, it is going to prevent bone deterioration in the jawbone and ultimately restore your facial features by fighting resorption. The process of resorption involves the implants stimulating the jaw to send a message to the body that the jaw is supporting teeth once again. Resorption will help the jawbone to regain some of the mass that it has lost previously. Many of our patients who visit our office notice a difference in their facial structure as a result. The Oral and Maxillofacial Associates state that All-on-4® implants have a success rate of 98 percent. With All-on-4® implants, patients have a 98 percent probability of leaving our Atlanta offices with a perfect set of teeth that are permanently attached to your jawbone. To discuss how successful the procedure may be for you, call (404) 891-9489. The first step: A detailed examination where we will look at your records, existing conditions, whether you have a denture, what your facial structure needs are, and any other factors that may come into play when placing your implants. The second step: Typically involves CT scans, which are 3D pictures, of the jawbone. The scans include the positions of the replacement teeth, while also giving us critical information about where the bone sinuses and nerves are located for the implants. The third step: Involves creating a computer simulation of the implants, which we digitally position into the jawbone at the appropriate location to give you the most support from your replacement teeth. We can adjust the implants as need be and fabricate your new set of teeth for your needs. The fourth step: Finally, the most important step is the oral surgery. During surgery, we will provide you with anesthesia and then place the implants directly into your jawbone to secure your new set of teeth in place. At Pampered Smiles, we can replace your teeth with this convenient and innovative procedure. To discuss the many benefits or to get started, call (404) 891-9489 and schedule an examination and consultation with our Atlanta, GA dental office. Q. What are all-on-4® dental implants? Q. Do I qualify for All-on-4® dental implants? Q. What is the process for getting these implants? Q. What happens after losing an adult tooth? Q. Will dentures stay in my mouth with implants? Q. What is implant supported dentures? The alveolar bone is the bone surrounding the root of the tooth that keeps the tooth in place. A clasp is a device that holds a removable partial denture prosthesis to the teeth. The denture base is the part of the denture that connects the artificial teeth with the soft tissue of the gums. Edentulous is a term that applies to people who do not have any teeth. A fixed full arch restoration is a common treatment option for edentulous patients who are missing either all or at least an entire arch of their teeth. 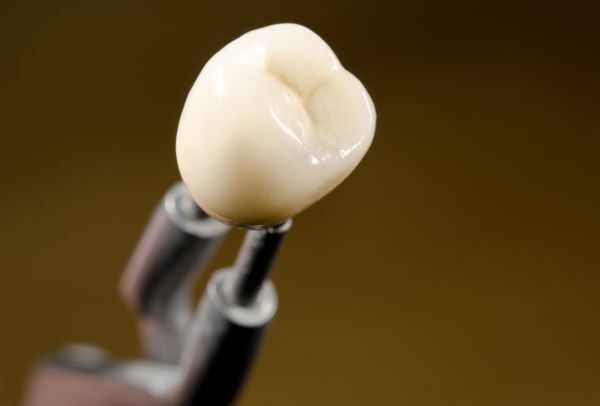 A fixed provisional bridge is a dental bridge that a dentist cements in place for a temporary amount of time to see if it works properly before making the bridge permanent. Full arch rehabilitation involves using the All-on-4 ™ to help patients maintain and use a new set of teeth that look natural. Full arch treatment is the treatment process of replacing an entire arch of missing teeth and ensuring that everything fits properly. A graftless procedure is a dental implant procedure that does not require the use of a bone graft prior to placing the dental implants. Nobel Biocare is a company that manufactures dental implants and continues to innovate the market with new products and designs. Periodontal disease is a condition that causes inflammation of the gingival tissues and membrane of the teeth, leading to tooth loss without professional treatment. Pontic is another term for an artificial tooth on a fixed partial denture. Resin and Acrylic are resinous materials that can be components in a denture base. Stomatitis is the inflammation of the tissue that is underlying a denture that does not fit properly. It can also result from other oral health factors. Pampered Smiles was established in 2008. When Is All-on-4® The Best Option? Who Should Perform Dental Implant Placement? Copyright © 2019 All Rights Reserved Pampered Smiles.